There’s no getting around it, university is a stressful experience. 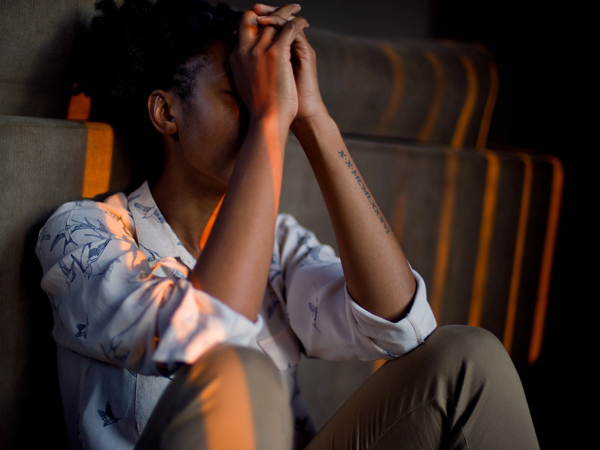 While a moderate amount of stress is to be expected, and gentle pressure can inspire you to do some of your best work, when you’re under too much stress, your health can be at stake. The good thing is, no one at Coventry University is alone, we are here to offer support for our students and staff. 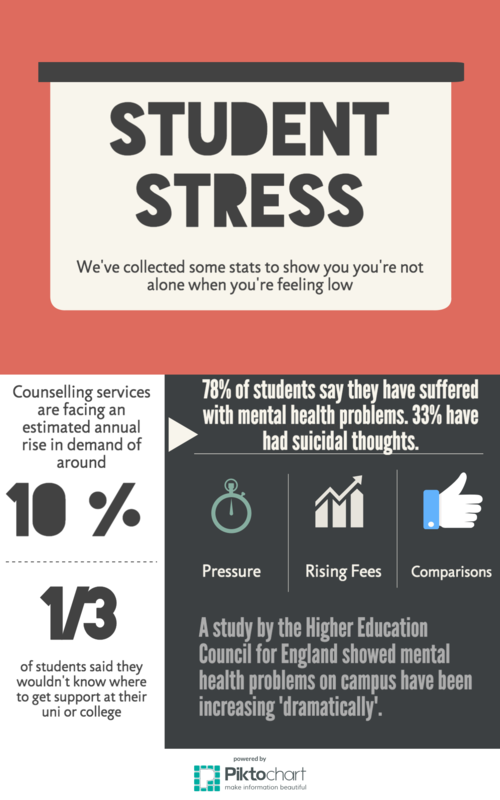 Stress Awareness Day 2017 gives us a chance to provide University wide support and advice to get you, and us, talking more about stress, as well as anxiety, depression, eating disorders and our community’s mental health in general. 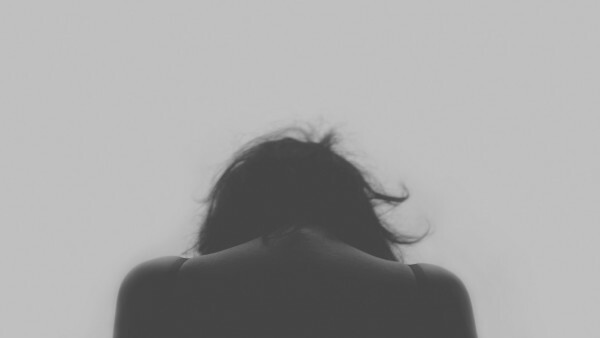 It’s easy to think you’re the only person struggling when low moments hit you. 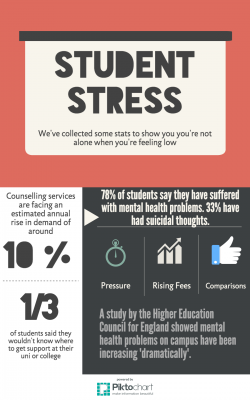 But at the close of 2015, an NUS survey found 78% of students had had mental health problems in the last year, and 54% did not report them. Here are some more stats which might help convince you you’re actually part of a whole community of people each going through something unique to them. While we don’t want anyone to be feeling like their mental health is suffering, it can be reassuring to know that others feel the same as you. It’s possible to be stressed out without realising it. If you’re struggling to sleep, easily irritated, experiencing any uncomfortableness across your chest or in your stomach, getting a lot of headaches, struggling to find the energy to do things, or finding yourself feeling poorly frequently, it might be that you’ve been pushing yourself too hard and your mind and body are feeling rundown. Take some time to think about how you’re feeling, and if you think you’ve started to feel too stressed, that’s where we the University, your friends and your family come in. We’re all here to support you. Have you been to the support section of the student portal? This will take you directly to the kind of support you need. Whether it’s your future career, mental health, physical health, home-life, a disability, or anything else that’s causing you stress, you can find information about support through this website function. 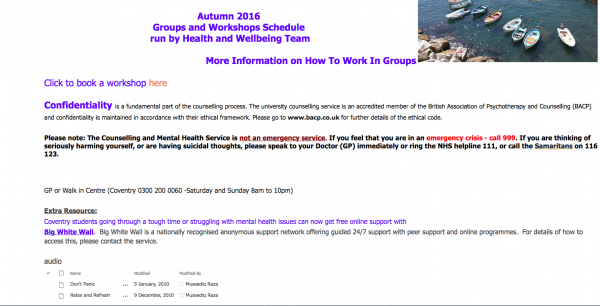 If you would like to register for counselling or speak to a mental health advisor, please email counsell.ss@coventry.ac.uk for a registration form. In this BBC article, student Meredith Leston makes the point that students today are prone to feeling financial, academic, and social pressures at unprecedented levels. If you are in need of any support to do with your workload, you can speak to your tutors who will be happy to discuss your issues with you. Remember, if you’re worried about your budget, there are lots of places you can find part-time work while you are studying. Use thefutureworks, or be proactive. Print off your CV and hand it in to the huge selection of shops, bars, cafes, restaurants etc. around Coventry. The increased use of social media to document our lives has created a culture of comparison, like never before. Remember when this famous Instagram influencer announced she’d had enough of ‘faking’ her own happiness on social media, revealing the work behind every seemingly effortless post? How many of us have had to work hard to make a picture seem easy or better than reality? 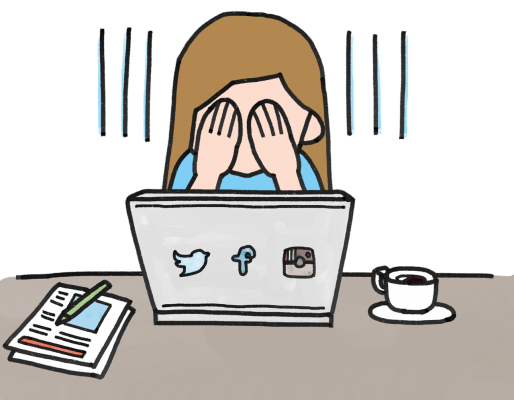 It’s worth reading this Huffington post blog called 11 Things We Fake in our Social Media Lives, which sums up all those things we look at in other peoples’ online lives and compare to our own. Other than the law, ethics and codes of common decency (we’re looking at you trolls), there are no rules about your personal social media use. You’re free to be yourself, share your interests, tell people you love them, support each other, or not use social media platforms at all if that’s more you! At the same time, remember too that you never fully know what some people are going through, and sharing their successes online might be one way of helping them through a time of distress. Read this blog piece for an interesting insight into how the ‘fake it ’til you make it’ idea can have a positive effect on some people’s mental health. While there’s no strict rule on how to ‘do’ social media properly, it seems like we could all do with being a little less hard on ourselves and each other. Stay on your own tract, try not to think other people are doing better than you, because what’s right for someone else isn’t necessarily what’s right for you. Here’s a fantastic website you could have a look at if you’re feeling stressed out, it’s called Student Minds and they’re a mental health charity. They also have a brilliant blog you can read, with loads of relatable student stories. UnCOVered’s guest blog written by Abby from the Health and Wellbeing department gives you a really useful insight into what their department can offer you. You can find them in The Hub, and their Faith and Spirituality Centre is just above them! 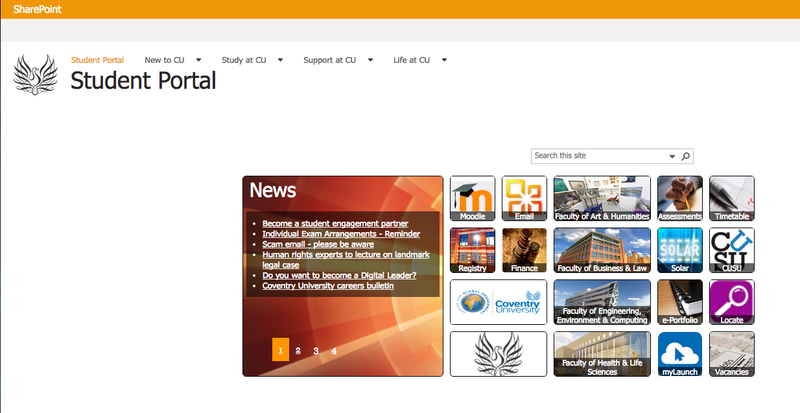 You can download Coventry Uni’s Health and Wellbeing app here on iPhone or here on Android. 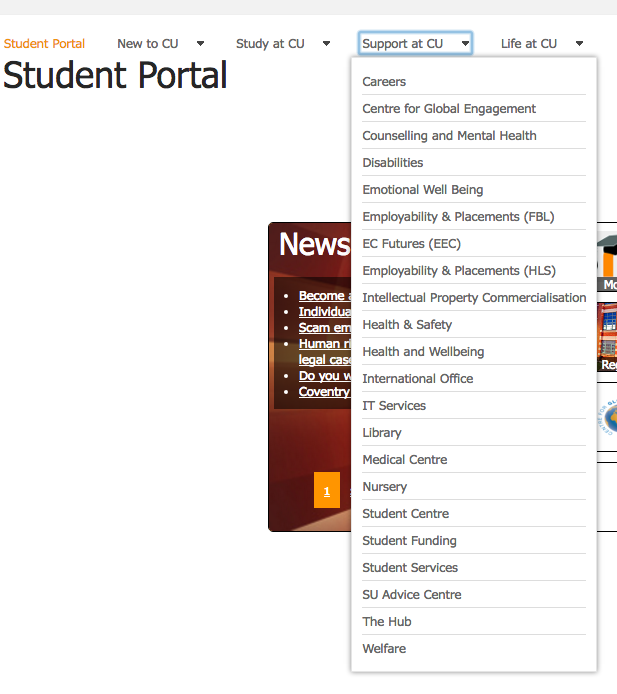 It features interactive maps to University buildings, the NHS walk in centre and A&E, emergency contact info, and links to public transport information. If you’ve found this post useful, or require any further information, please let us know in the comments below, or on social media.